In this information heavy age there is an art to staying up to date with all the latest relevant information and a crash course to be done in the tools used to organise this information. Years ago I discovered Google Reader, before I was meticulous with my bookmark organisation, but swapping between PC/Laptops meant occasionally losing that info. (The days before Chrome and cloud syncing.) Google Reader became my default tab each time I booted my browser for not only work related news and info but for following some of my favourite webcomics and bloggers as well. When the news came that Google Reader was closing down I had already been using Feedly for some time thanks to a post by Geek in Heels. The announcement came and Feedly said they were migrating existing users across and I think I was one of the lucky ones that didn’t really notice the transition from syncing with Google Reader to working independently of it. I have been using is ever since on Chrome and on Android and for the most part have enjoyed it’s features. The most useful of which was putting oldest unread articles first to keep up with webcomics and being able to change the background colour to make it easier to read, it’s also got an easy to use add/remove/reorganise organising page. Yet recently I have been having issues, it’s had some updates and now has a paid version that will let you add things like Evernote and Pocket to it. The main issue is constantly getting unread articles appear from over 100+ days ago or never marking anything as read. I checked on their own forums and reinstalled it on all my devices, even cut down on some feeds too, but it was still doing it. I have also started using Pocket a lot more recently as my 2+ hours of commuting a day has little to no signal so I have been saving more and more articles relevant for work in Pocket to read on the go. I have found this wonderfully seamless and really useful and have managed to catch up on things a lot better this way. Anyway I recently decided to have a poke around the other Readers out there, after the dust has settled from Google’s departure and more companies are ensuring that they have an asynchronous multi-screen experiences between web and mobile I thought it was time to have a shop around. First up Pulse, I had given this a go in the past, mainly on my tablet, it was sleek and responsive, but not the most user friendly. It went under some heavy redesigns and after not using it for a while I found myself a little lost when coming back to it. I never really found it as customisable as I would like and at the time Feedly was my primary Reader, so Pulse got used for extra stuff that I would keep track of but never really keep up with. I have given it another go recently and discovered it’s now part of the LinkedIn family of apps, and it’s just as user hostile as before when it comes to simple things like organising your feeds and folders. I see what they are doing with LinkedIn and it sort of makes sense, news articles generated by your professional network on the site, but for me it’s just too much swish and not enough substance right now. Next is the Digg Reader, now I was vaguely aware of Digg, a site that allowed upvote and downvote of content by users that showed the popular articles from across the web. Like Reddit it was something that I never really gotten on with, too much text on screen making it not the most readable of sites. I was vaguely aware that Digg had a Reader for web and iOS as well, but without an Android app I never really looked into it much. I have just learned that there is now an Android app so now I am giving it a go. That and it has Pocket integration, so when I save something in Digg it will get added to Pocket, a very handy feature. The first impression is that is is functional, clean and similar to Feedly in a lot of good ways. However there are far too many clicks to remove a feed from the collection. 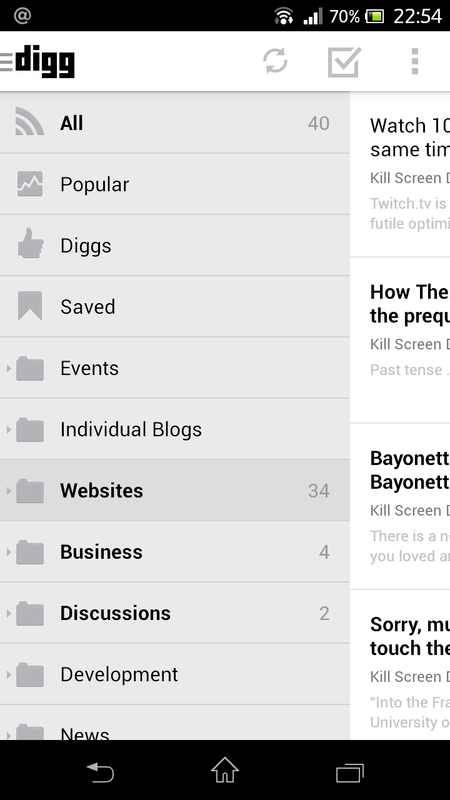 The drag and drop of folder and feeds down the side to reorganise them is great and something I think Feedly lacks. I have then spent the evening migrating feeds over manually, I could have exported and imported the OPML data but I decided to have a bit of a spring clean while I was at it. This also ended up in me realising that there was a lot that I still liked about Feedly, and that despite the syncing niggles recently I wasn’t that keen to abandon it completely. So after adding all my ‘work’ feeds (gaming related news, discussion, websites, blogs) I decided that I will try dual running Feedly and Digg for a while. Feedly is now home to blogs and webcomics, things to check when I have time, Digg is now home to articles and news updates to help with my job/course. So far so good and the mobile app has synced with the web version and it is smooth and responsive, and is nice to use. So I’m going to stick with this set up for a bit and see how it goes. It might be a little overkill to use two feed readers like this, but it already feels more organised for me. I know that when I want to read a comic or catch up with a blog I boot up Feedly, then when I need to work then I need to be on Digg. I did also look at FlipBoard briefly, and although it has a nice feel when using it on a touch screen, especially the way the pages ‘flip’ over. But I didn’t explore it too much as it wasn’t immediately evident as to how you would add custom feeds to it. But it’s still on my phone at the moment as I notice people in my Facebook feed are using it so I’m going to give it a go just in case. In conclusion I think Feedly is just a little easier to use when managing feeds and has a few more customisation options. But Digg Reader is just as good for the most part and has free integration to services like Pocket. So I don’t think I could pick just the one right now, I would have to use Digg more and see if Feedly manages to calm down now that I don’t have as many feeds in it.